“The American people should have a voice in the selection of their next Supreme Court Justice. Therefore, this vacancy should not be filled until we have a new president,” McConnell said, at a time when other elected officials, from Sen. Bernie Sanders to future Senate Democratic Leader Charles Schumer, were releasing statements offering condolences to the justice’s family, which includes 26 grandchildren. Given that Republicans stand to lose far more with a deadlock over a vacant Supreme Court position than Democrats, McConnell’s pronouncement seems more bluff and bluster than ultimatum. With 11 months remaining between now and the inauguration of a new President of the United States, chances are very good that the coming year will see a contentious — but ultimately successful — Supreme Court nomination battle. Already, several civil rights groups have weighed in with their desire to see President Obama’s next nominee — which would be the third of his presidency — continue the trend he established with his first two choices in helping to diversify the nation’s highest court. In 2009, President Obama nominated Justice Sonia Sotomayor as the Court’s first Latina Justice, and its third woman, to fill the vacancy left by Justice David Souter’s retirement. A year later, Justice Elena Kagan, nominated by Obama to replace the retiring Justice John Paul Stevens, became the Supreme Court’s fourth female Justice. As President Obama considers the next steps for this seat on our highest court, we are reminded of the President’s outstanding record of appointing highly qualified judges who reflect the diversity of the nation they serve. President Obama has appointed 21 Article III judges of Asian American and Pacific Islander descent, which is more than all prior presidents combined. Within hours, others — including Chris Kang of NCAPA — added their voices to the mix in demanding the next Supreme Court nominee hail from the AAPI community. President Obama has made history by using his power to nominate and appoint a historic number of AAPI federal judges, which doubled the number of AAPI’s serving in that capacity in his first three years in office alone. Of course, when it comes to the Supreme Court, racial identity alone is not sufficient to qualify a Justice to that position: in addition to a seeking a Justice who can represent a historically marginalized identity (like that of the AAPI community), we should also want a Justice who is bright, analytical, compassionate, courageous, and — above all — fair-minded. Chances are very good that Judge Sri Srinivasan — a recent Obama nominee to the DC federal circuit Court of Appeals who was confirmed in 2013 by a unanimous Senate vote to become that court’s first South Asian American judge — will be that Supreme Court candidate. Judge Srinivasan began his legal career with a degree from Stanford Law, and followed that up with two clerkships including one with Supreme Court Justice Sandra Day O’Connor. Srinivasan then went to work in the private sector as a defense attorney before joining the office of the US Solicitor General under the Bush Administration between 2002 and 2007. With Obama’s election, Srinivasan returned to private practice — famously defending former Enron executive Jeffrey Skilling before the Supreme Court against charges of fraud — before returning to public service for two years as Principal Deputy Solicitor General for the United States under the Obama administration. In 2013, Srinivasan was nominated and confirmed by President Obama to the US Court of Appeals for the District of Columbia Circuit, a circuit long perceived to be an “incubator” for future Supreme Court Justices. Srinivasan makes for an attractive candidate for several reasons, the most compelling of which is that he is likely to survive the intense scrutiny of a contentious Supreme Court nomination fight. 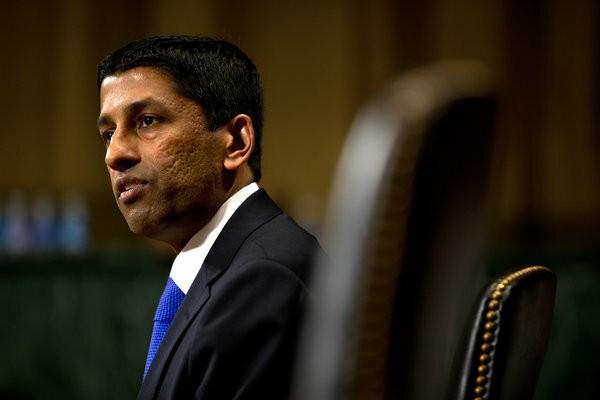 In contrast to many of Obama’s judicial nominees, Srinivasan’s nomination process in 2013 was largely “uneventful“, in part because Srinivasan’s record as a litigator have given him limited avenues with which to express the kind of partisanship that Republicans could take exception to. Indeed, Srinivasan’s track record of defending big business interests as a private attorney might make it seem like he is a friend to Wall Street; of course, attorneys often take cases involving clients with whom they strongly disagree. In fact, we have reason to believe that if he were appointed to the Supreme Court, Srinivasan would be a liberal-minded justice. In the rare instances where Srinivasan stepped out of his role as a litigator to express his own legal or judicial opinions, Srinivasan has sided with traditional leftist ideologies: Srinivasan reportedly went out of his way to file pro bono briefs opposing voter ID laws in Indiana, defending affirmative action, and opposing government surveillance. Mother Jones reports that Srinivasan worked to establish before the Supreme Court that a minor gun offense is not sufficient grounds to deport a legal immigrant and represented a child suing the state of Arizona for better access to English-language learning classes. As a federal judge, Srinivasan has authored decisions that guaranteed minimum wage and overtime pay for home health care workers. Sri Srinivasan is unlikely to be the super-progressive justice I might love to see serve someday on the Supreme Court. But, I have to agree that Srinivasan is a compelling candidate to fill the vacancy left by Justice Scalia. If he is confirmed, Srinivasan would become the Supreme Court’s first Asian American justice, its first South Asian American justice, its first non-Judeo-Christian justice, and its first Hindu justice. But, more importantly, Srinivasan’s documented defense of affirmative action and immigrants’ rights leads me to believe that he is the sort of liberal, humanist justice that the nation needs to finally bring the Supreme Court of the United States into the 21st century. In 2012, the White House celebrated its efforts to ensure that federal judges “resemble the nation that they serve“. It seems like high time that the same finally be true for the nation’s highest court — with regard to the racial makeup of its justices, but more importantly with regard to its protection of civil rights for America’s marginalized people.